A cold and dull Sunday morning brought out the stalwarts for the first recoil therapy session of the New Year. 25 hardy members turned up to enjoy the wind chill that did not take any prisoners but did not stop them either judging by the ammo flowing out from stock. A very good day in all and a chance to meet up with old pals after the Christmas lay off, discussions regarding future shoots when the weather gets more tolerable brought up the question of all day shoots so that those who cannot, or are reluctant to get out early have the opportunity to come for the afternoon shoot and those who want to can stay all day. All in all a good start to the year with the promise of better to come. Well, what a wonderful second shoot of the year including a most interesting competition. Cold windy and wet conditions where we have to lay in the elements and shiver, happily didn’t apply at all as we enjoyed the comfortable indoor range facilities, superbly enhanced by everyone’s generosity supplying tuck from pies and crisps to cakes and choky bars. The normal facilities of hot and cold drinks were in abundance. For the competition small bore was employed with 21 intensely tight targets per card leaving no room for error. A most enticing prize for the winner concentrated everyone’s efforts. How to remain rock steady and yet conform to the time limit, that was the challenge. There were some who tried very hard but couldn’t avoid those pesky errors, hold on, that adequately describes the writer, oh dear! Very many congratulations to the winner who took the prize and runner up who received small financial compensation. Many thanks to both clubs for a great atmosphere and to the organisers. You know who you are and we all know too and are most grateful. Members came from far and wide, north of Stafford, Yorkshire and all around the midlands. Very many thanks to you all for a great event. A number of the club’s members were invited by a former member, Rob, who now resides in southern parts, to be guests of his new club at a 1,000-yard shoot at Bisley on Friday. Perhaps because the weather forecast could best be described as ‘invigorating’ or maybe because it would have entailed an early start to the day, only the Training Officer crawled out of bed at 5am and began the long journey south. That, of course, had its positive side. With only one other shooter to compete against, I was guaranteed at least second place. We signed in at the range office and made our way out to the 1,000 yard point on Stickledown Range. The ranges next to Stickledown are named according to artillery practice, one is Short Siberia, the other Long Siberia, thus, in my book, making Stickledown itself Siberia Ground Zero. On Friday, the ground was well below zero. It looked deceptively pleasant from within the car: bright sun was illuminating the target from over our shoulders. Perfect for shooting ! The downside was that the wind was actually rocking the car. Rob and I set up our rifles on the firing point. Unpacking my mat and laying out my 7mm Remington Magnum rifle took about a minute. Rob took rather longer to set up what can best be described as field artillery. It’s a .284” Winchester (the ‘in’ cartridge with the F classeratti) custom built by Mik at Dolphin Guns with every gadget and gizmo going including a micro-adjustable tripod (why have two legs when you can have three?). Given the temperature, Rob made a mental note to ring Dolphin and enquire about the electrically heated trigger and cheek piece options. As we hadn’t been able to zero, we agreed to operate as a team to get the first shot on paper. Rob dialed in the elevation on his scope required to shoot at 1,000 yards whilst I did some quick calculations to see what effect the headwind would have. More elevation was required. Rather a lot more. Further elevation was then needed to compensate for the low temperature. Rob and I looked at each other. Were 21 minutes extra really necessary? It sounded a lot. The calculations were re-done. 21 minutes extra elevation was what the maths said. 21 more minutes were dialed in. Next for azimuth correction. The wind was 22mph gusting to 37. Gusting very erratically, and different at all distances out to the target. We quartered the range, estimated the average wind for each quarter, weighted the averages to account for the declining bullet speed with distance and then dialed in the resultant windage adjustment. I settled down behind my scope (primarily to expose as little surface area to the wind as possible rather than just to look through it) and watched for the fall of the first shot. Rob exhaled, rested, squeezed the trigger. Almost two seconds later I saw a splinter of ice being chipped from the perma-frost below the target. “8.4 minutes more elevation ?” queried Rob, incredulously. The adjustment made, Rob settled again and took his second shot. Adjustments were made. A third shot taken. For the next hour Rob continued to perforate the paper, almost always within the 5 ring and frequently in the V bull. How did I do ? Well, I didn’t. In keeping with the tradition of carrying on in the face of adversity, I put pen to paper to inform those who shall be of the same demeanour, the joys of cold weather shooting. Sunday came as did 31 stout members of the club (some were thinner) to enjoy the venue of Garlands in the snow and wind and rain and sun and wind again. Snow and sleet attacked us through the day but everyone kept at it just to keep the barrels warm so that they could warm the fingers. Several new chaps turned up to have a go at trying to hit paper, with surprising regularity and accuracy. Interaction to solve problems resulted in a good days shooting, with a fair few laughs on the way through. Vouchers for grub were, as always, well received and consumed. Dates for your diary for Catton will be posted on the members page, please check it out as there is no Garland’s meet next month as it is now at Catton. Here ‘s to the warmer weather and new ventures coming to fruition in the near future. A bright and cold windy morning with an early start meant that it was so tempting to stay indoors and watch the Winter Olympics with a nice warm cup of tea, but the desire for a little recoil therapy finally pushed the decision to venture out to Kingsbury. Driving through the Warwickshire countryside and firmly believing that it was way too cold for anybody other than a winter Olympian to be out, I was genuinely surprised to see the number of twenty five other recoil addicts who had turned up for a little 25 metre shoot. Maybe the little nudge email from the club secretary the other day had an effect? The club chairman, soon had everyone organised and once again demonstrated his skills in herding kittens onto the range, many of whom were oblivious at this point of his weapons of mass distraction, the fabled marmite sarnie hoard. We soon had the first shots going down range, with some excellent .22 shooting and case extraction being demonstrated by those with their new AR based rifles. This first session was closely followed by the always-entertaining game of “find the cases” and then we were onto the next group of shooters. A steady stream of changeovers then ensued, with accuracy thwarted by the much welcome sun causing glare issues for yours truly, and the threat of the marmite sarnie deployment causing many others to flinch at the last minute. 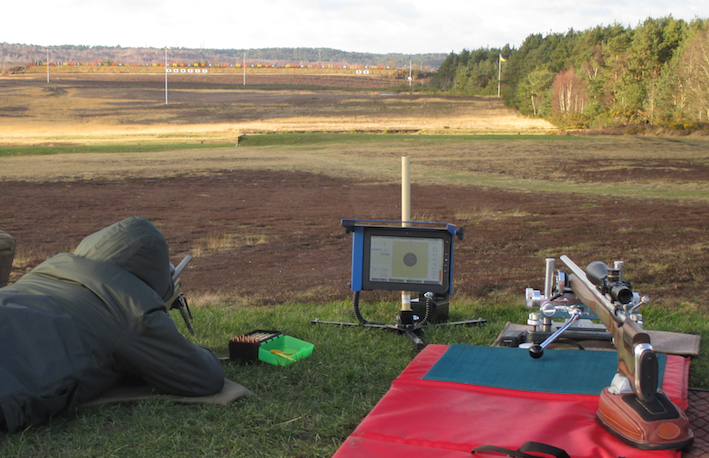 Although the 25-metre range is never particularly testing, it is a useful distance for setting and checking zero’s and there was a steady stream of some nice rifles being used and good shooting practice being demonstrated by both the old club members and the new. This together with the usual good-natured banter and friendship offered within the club made for a very pleasant morning out in the fresh air, or as the old chairman called it, “Antarctic avenue”. Well, what a busy day on our private range all day shoot. Twenty-five members, including two new probationaries arrived and were rewarded with a quite pleasant day with some sunshine. Signing in took a little time but by 10-00 AM the briefings were completed and the shooting programme commenced. Great teamwork meant that the probationaries’ instruction programme advanced in good order and with membership now at increased levels our training officer had an excellent volunteer assistant. The vouchers entitled each member to a free bacon, sausage or such like butty, tea or coffee. Needless to say the catering facilities were kept busy whilst all our officers, as always, assisted, so a great job done by you all, as usual guys. Not sure if we have any bell ringers in the club but the targetry was well punished and some were well splatted or clanged loudly confirming good precision. Our training officer brought his usual collection of historic or rare pieces, most intriguing! He and A N Other then spent the afternoon obliterating spuds at range of 270 yards and, when those ran out, indulged in some synchronised pairs shooting at the long range steel gongs. An excellent full day’s shooting sports concluded right up to finishing time and thanks once more to the organising team for the excellent catering and shooting facilities and thanks to all for the help that is always on hand whenever needed. Sunday April 1st, Kingsbury A.
Sunday April 8th 2018. Ladies’ Day? A good turn out on a pleasant day weather-wise saw twenty-one arrive for today’s event. The club, having a good contingent of lady shooters, was very happy to see another couple visit to see what we are all about. A good long discussion and briefing lead to further enthusiasm by both parties with this enhanced following a visit to the ranges. Two new members signing up and eager for our next event, excellent! Now to anyone who might have expressed an opinion that lady shooters are only capable of handling small calibres, it is hereby confirmed that is not true. Our ladies are very capable of handling shotguns and most rifle calibres including full bore. Much to their credit they have also shown they are capable of winning competitions. The day’s events were further enhanced by the regular vouchers for all members attending entitling us all to free butties and drinks. My, must have, is bacon and egg butty with a lovely coffee, yumee. Another excellent full day’s shooting sports concluded right up to finishing time and thanks once more to the organising team for the excellent catering and shooting facilities and thanks to all for the help that is always on hand whenever needed. The Club AGM took place Saturday April 28th in a centrally located village hall. Business was completed in good order and very many thanks to the wonderful ladies who ran the catering facilities for the AGM. The following day April 29th the club Kingsbury rifle shoot took place. Staffs Phoenix Kingsbury 25 metre Shoot, Saturday May 5th 2018. What a contrast to last weeks, cold, rifle shoot on the 29th April. This weekend was a bank holiday weekend so not many expected perhaps? Even most of the range-conducting officers were away. None the less, clear skies and bright sunshine welcomed fifteen members to the event, what a beautiful morning. 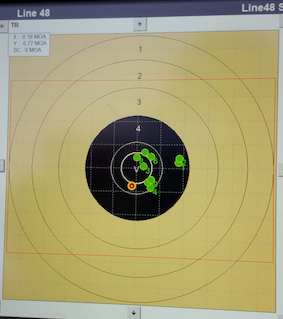 Our secretary had brought some testing targets for the small bore calibres but not much to say about that on my performance. Our military colleagues were on A range and what pleasant conversations in support of our mutual shooting interests. By limiting details to about 20 minutes we managed to accommodate everyone and round back on range again by an efficient rota system. Everyone had his or her fill. Another great shooting atmosphere enhanced by intense sunshine. Many thanks Mr Secretary; it was just we two oldies this morning. One of us is much older and creaky, wonder which one?? No second-guesses needed! Induction meeting at LSC was well attended and was a great success with lots of interaction and discussion on many subjects relating to grand art of poking holes in paper at a distance. Subjects included the standard of cakes, how to set up scopes and zero them, range safety, formation of the club and who is who and who wants to be who, many offers are on the cards for development in running the club and range officials of the future. After the chats, the paper got punished, a great improvement in skills being promoted by the input of senior and not so senior members of the club assisting in advice on how to do it safely and consistently. 16 members participated and a good time was had by all, a very worthwhile meeting. The update on Brankley Range project was received with enthusiasm and anticipation now that things are moving forwards after the long delays in the planning process. Good luck John and Pete after all the hard work and sweat that is now starting to show results. Twenty club members assembled for our all day shoot at Kingsbury and found, much to our delight, that we had the range to ourselves ! The sun, as has been its wont this month, continued shining and so many of the assembled party saw, for the first time ever, a patch of bare, baked earth where once the infamous green slime swamp traditionally encroaches on the butts. Shooting began at 300 yards to ensure all the rifles were correctly zeroed but we quickly fell back to 600 yards for the rest of the day in order to pick up the challenge that the swirling breeze threw down to us. A challenge ably met by most present, including a few probationary members who quickly learned from their tutors how to estimate and compensate for the dispersion caused by the wind. 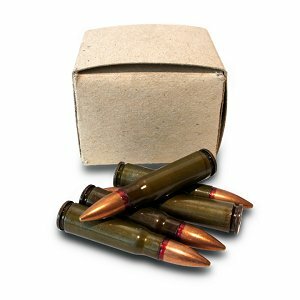 7.62×39 surplus: The future long range cartridge contender to replace 6.5 Creedmoor and .284 Win ? The first few days saw an intercontinental adventure with Badger, Captain Carbon and Van Diesel (there are stories behind all those nicknames) venturing to Bohemia to spend a few days shooting pistols (lots of pistols), carbines (lots of carbines), machine guns (did we mention how quickly one can get poor ?) and shotguns in a delightful country where ice cool beer and roast meat are the only rivals to spending time shooting. Oh, and there were tanks too. Lots of tanks. 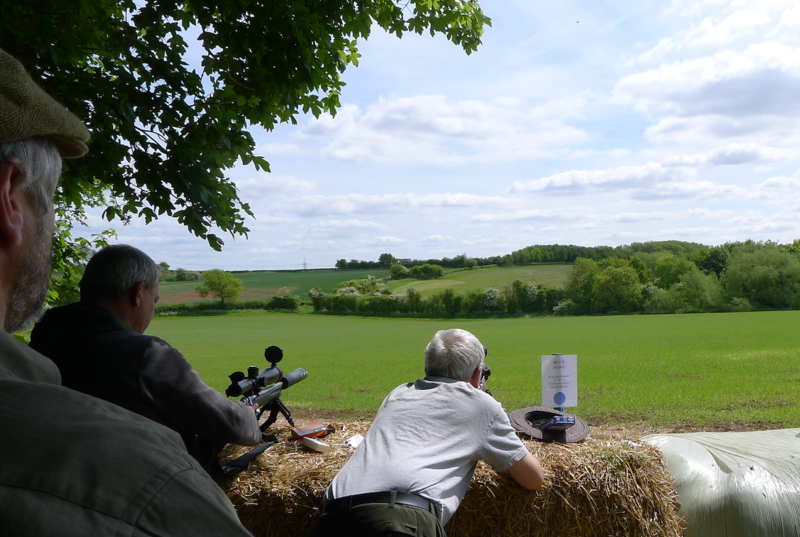 Catton Park came along too, more sun, and the Mauser crew were out in force with Badger, Batters and Musclepup duelling to hit the 450 mard steel fox over open sights using K98s. The fox retired hurt, very hurt. August saw the club shooting at Kingsbury and Garland’s as usual, and the Long Rangers travelling up to Eskdalemuir in Scotland to partake of something a little more challenging. An overnight stay at a delightful hotel in Langholm (excellent beer, superb food and very comfortable rooms) was followed by a full day’s shoot at Gardner’s range in Eskdalemuir. The sun shone, the breeze was just sufficient to keep the midges at bay and our hosts were as helpful as could be desired. 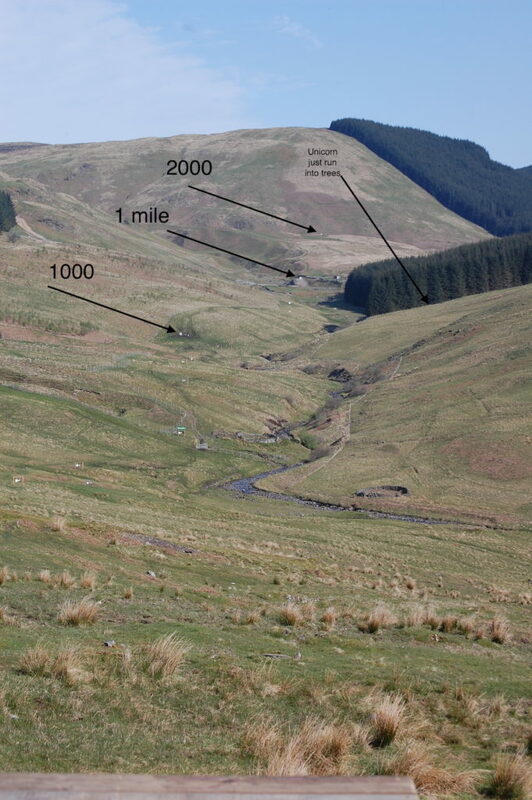 Eskdalemuir has steel targets arrayed at 100 m intervals from 100m to 1,000m, and then at distances of 1 mile, 2,000m and even ‘way out there in the distance.” The range is approved for all legal centrefire calibres and ammunition types.